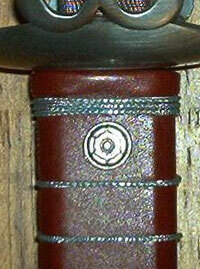 Decorative elements give your scabbard that little extra something it needs to show that it is something special. Our ancestors tended to like very flamboyant decoration on their arms and armor, but I've found that today's customer likes things to be a bit more understated. If you want the gaudy to the simple or anything in between, I can supply what you are looking for. Note that the items I have pictured below are just some examples of elements I have. I have many more and have access to just about anything that you desire. If you want something to match your coat of arms, your favorite animal etc, simply ask. This is a nice heavy duty accent cast in solid pewter. 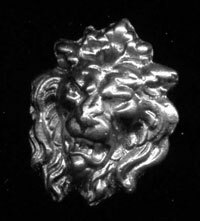 Lion head accent, another solid heavy accent cast in solid pewter. Julian was the patron saint of wandering bards. 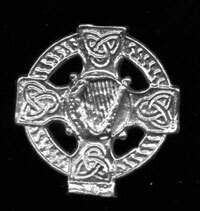 Accent in solid pewter. 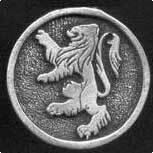 The lion rampant was seen on many medieval coats of arms. This one is in solid pewter. 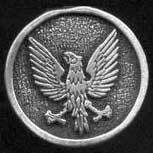 The fanciful griffin was also popular in medieval heraldry. 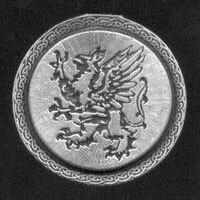 This medallion is in solid pewter. 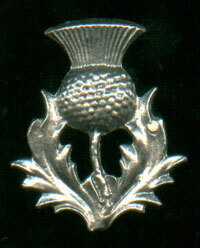 The thistle is the symbol of the prickly and independent Scots. This one is in solid pewter. 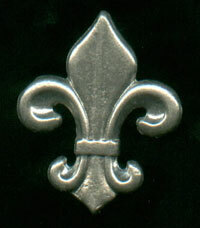 The fleur-de-lis is the traditional symbol of France. This one is in pewter. Three-pointed knot, also known as the Trinity knot, in pewter. 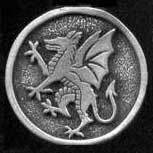 Various generic decorative elements in pewter. 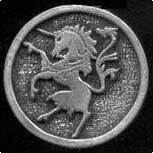 Unicorn heraldic device. Solid pewter. 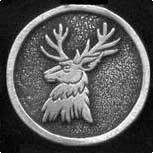 Stag heraldic device. Solid pewter. Scallop heraldic device. 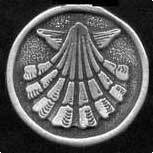 Associated with Saint James, the symbol of the scallop marked those who had made pilgrimage to the shrine dedicated to him in Santiago de Compostela, Spain. Solid pewter. Eagle heraldic device. Solid pewter. 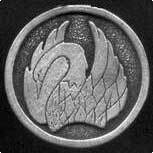 Dragon heraldic device. Solid pewter. 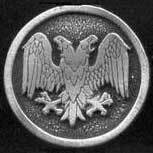 Two-headed eagle heraldic device. Solid pewter. Swan heraldic device. Solid pewter. 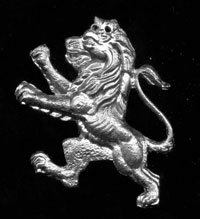 Lion rampant heraldic device. Solid pewter. 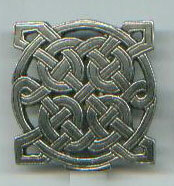 Square celtic knotwork pattern in solid pewter. 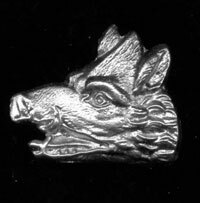 Wolf's head in solid pewter. Round and square celtic knot stamps. 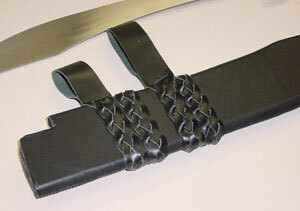 Here in one of our earlier efforts we used braided leather in the suspension system for a Del Tin Falchion. 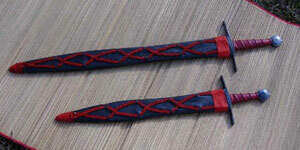 Here is a pair of double braided fantasy-type scabbards.